Rivivi la gloria delle Olimpiadi di Londra 2012 in un tour di 1 ora e 25 minuti dello Stadio olimpico, sede della squadra di calcio del West Ham United, a Stratford. Usa un dispositivo portatile interattivo guidarti durante il tour, visita i camerini dei giocatori del West Ham, fermati sulla pista di riscaldamento usata da Usain Bolt e Mo Farah e posa per la foto sul podio del vincitore. Questo tour è ideale per famiglie e per gli amanti dello sport. 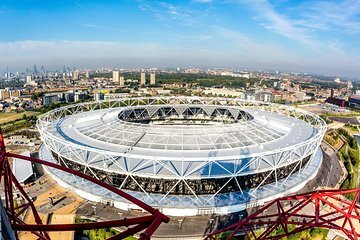 Dopo aver raggiunto lo Stadio olimpico, situato a 15 minuti a piedi dalla fermata Stratford della metropolitana, sarai accolto da un ospite dello stadio che ti darà una panoramica dell'itinerario del tour. Quindi, con il tuo dispositivo portatile interattivo, dirigiti alle sale d'accoglienza per osservare i momenti salienti dei Giochi Olimpici del 2012 e goditi la vista panoramica dello stadio. Dirigiti poi allo spogliatoio, utilizzato dai giocatori di calcio della Premier league nei giorni di partita del West Ham. Da qui, visita la pista di riscaldamento utilizzata da Mo Farah, Usain Bolt e Jessica Ennis durante i giochi del 2012. Fai una corsa in pista e posa sul podio del vincitore per una foto. Passeggia accanto al campo da calcio vuoto e immagina l'atmosfera scoppiettante creata da 60.000 tifosi quando lo stadio al massimo della sua capacità. Al termine del tour, restituisci il tuo dispositivo portatile e visita il negozio di souvenir del West Ham United per acquistare ricordi sportivi. Interesting tour with knowledgeable guide. It was interesting to see the short history of the stadium since the Olympics to now. Very interesting tour of the stadium. The tour was very interesting from the Olympics 2012 to the current use of the stadium. Stunning! The tour is definitely a must-do when visiting London. Had a great time with my friends! Great tour, guide was informative, learnt a lot about the team. Personal experience behind the scenes. Walk on to the pitch was brilliant! Length of tour was just right, perfect way to enjoy a day. Impressive stadium! The guide was very informative and it was very impressive seeing the stadium completely empty. The best was the tunnel! Our guide was very friendly and knowledgeable. The multi-media aspect of the tour was also very interesting as well as the story behind the stadium and the entire infra-structure! Definitely worth the visit! Great tour of the stadium that already has some amazing history. Was very impressed with how it has transformed post London games and how it can be used as a multi event arena fit for concerts, football, rugby and athletics! Great to see this stadium from inside!! I recommend you take a tour! We did even go through the player's tunnel, so exciting!! Great tour! Our guide was super well informed and shared a lot of good information with us. The tour was amazing. They showed us different areas of the stadium and gave us time to take all the pictures we wanted. We also watched some videos that showed us not only things about West Ham but also about the stadium. Recommended! This was quite a cool way to see this special stadium! The place itself is really impressive and the view from the stands is actually pretty impressive. The tour guide was very knowledgeable as well and very accurate in his responses.